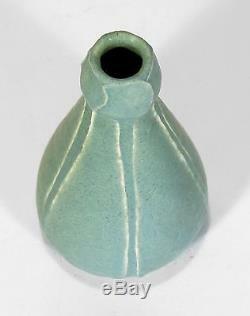 Here is a great piece of Grueby Pottery with a double gourd vase form with 2 rows of well tooled leaves. 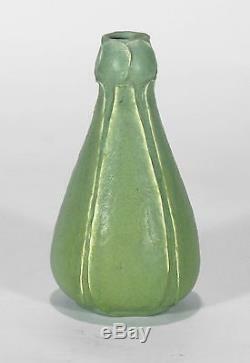 The bulbous top has overlapping leaves emerging from the curled out leaf tips of the lower portion. 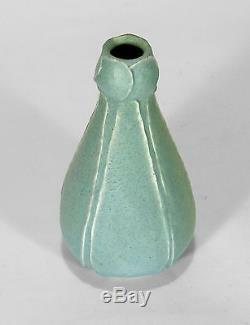 It is covered in a nicely curdled pale blue glaze which blushes to light green on one side. 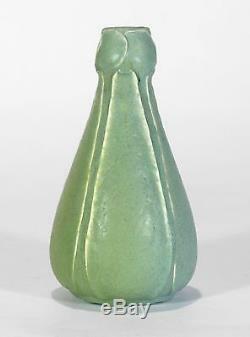 The glaze thins nicely over the leaf edges, highlighting the decoration. It is in great condition with no chips, cracks, repairs or firing flaws, just a couple barely visible nicks to the leaf edges. 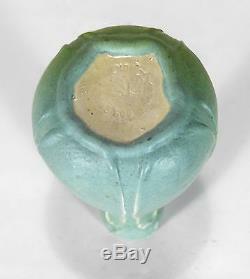 Marked with the earlier Grueby Faience Boston USA die-stamp, and a partially visible incised decorator's mark, either MS for Marie Seaman, or WP for Wilhelmina Post. 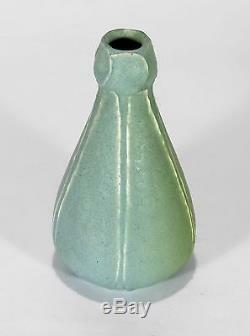 It measures 6 7/8 inches tall and 3 3/4 inches in diameter at the widest point. 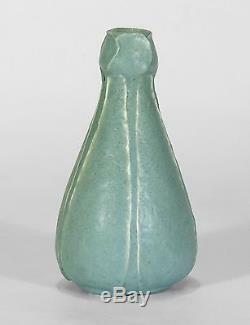 A rare gourd form example of the quintessential Arts & Crafts New England art pottery. 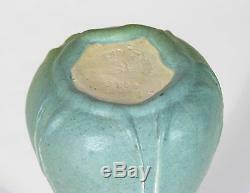 The item "Grueby Pottery rare matte blue green double gourd leaf vase Arts & Crafts Boston" is in sale since Wednesday, March 1, 2017.